In actual warfare, according to M. R. D. Foot, blackouts do not impair navigation by bombers because navigators focused more on reflected bodies of water, railroad tracks, or large highways. The chief purpose is to mobilize the entire civilian population, and provide a test to make sure they are obeying the rules. The blackout was enforced by civilian ARP wardens who would ensure that no buildings allowed the slightest chink or glow of light. Offenders were liable to stringent legal penalties. Blackout restrictions greatly increased the dangers of night driving and fatalities increased as a consequence. As a result, some aspects were relaxed and speed limits were lowered. The anticipated increase in crime rates did not occur. The continental United States was not exposed to air attack, but along the Atlantic coast, the lack of a coastal blackout served to silhouette Allied shipping and thus expose them to German submarine attack. Coastal communities resisted the imposition of a blackout for amenity reasons, citing potential damage to tourism. The result was a disastrous loss of shipping, dubbed by German submariners as the "Second Happy Time". Blackouts were held in mainland cities, and along the coastal areas long after any enemy threat existed; the primary purpose was psychological motivation of the civilian population which saw blackouts as a patriotic duty. Light can simply be turned off or light can sometimes be minimized by tarring the windows of large public structures. In World War II, a dark blackout curtain was used to keep the light inside. Tarring the windows can mean a semi-permanent blackout status. The benefits of blackouts against air attack are now largely nullified in the face of a technologically sophisticated enemy. As early as World War II, aircraft were using radio-beam navigation (see "Battle of the Beams"), and targets were detected by air-to-ground radar, (e.g. H2X). Today, not only are night-vision goggles readily available to air crews, but sophisticated satellite-based and inertial navigation systems enable a static target to be found easily by aircraft and guided missiles. 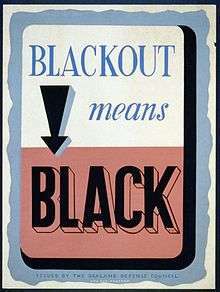 1 2 3 4 5 6 "New restrictions on the home front - Britain is blacked out!". 2 July 2006. Retrieved 19 Feb 2011. ↑ Barrow, Mandy (2010). "The Blackout". Britain Since the 1930s. Retrieved 19 Feb 2011. ↑ Robert Mackay (2002). Half the Battle: Civilian Morale in Britain During the Second World War. Manchester University Press. pp. 51–2. ↑ The activities of ARP Wardens led to ambivalent public attitudes and the catch-phrase put that light out!. The BBC sitcom "Dad's Army" includes an officious and disliked Warden. ↑ "The Arsenal of Democracy". Michigan Department of Natural Resources. Michigan Historical Museum. Archived from the original on 28 December 2012. Retrieved 31 March 2015. ↑ "MICHIGAN CIVIL DEFENSE MUSEUM, online historical museum".